The euro pullback spurred by the Federal Reserve statement that continued to regard the slowdown as having to been partly caused by transitory factors, was seized upon in Europe as a new buying opportunity. Support is seen near previous resistance in the $1.1050 area. The euro extended its recovery, rising to almost $1.1250. The retracement objective of the slide since mid-December comes in near $1.1265, which is also the boom of the shelf created in February. Above there, the $1.1515 area is the 50% retracement, while the double bottom projects toward $1.1600-50. The fact that the euro advance resumed in Europe also speaks to the positioning explanation of the price action. The sell-off in European bonds continues. The 10-year German bund set its record low yield on April 17 as the generic yield eased to 5 bp. It finished last week near 15 bp and today reached 37 bp. Spreads have not changed as much as one might expect. Over the past five sessions, the premium offered by Italy and Spain has actually narrowed by a couple basis points. Usually in a rising interest rate environment the spreads widen. Moody's downgrade of Greece to Caa2 from Caa1, with a negative outlook, has been ignored. Moody's is concerned that Greece may not be able to strike a deal with its official creditors, but that is old news. Instead, the market is focusing on the recent progress, and there is some creeping optimism that a deal can be reached in the next few weeks. Greek bonds are bucking the regional trend. The 10-year yield is off 14 bp today to bring the five-session decline to 107 bp. One of the big concerns is that deflation pressure leads to a vicious cycle that keeps consumers sidelined, weakens the economy and keeps downward pressure on prices. Spain's experience continues to refute this narrative. Today it reported that is flash CPI stood at -0.7% in April after -0.8% in March. It is one of the deepest deflation experiences. It reported Q1 GDP accelerated to 0.9% (quarter-over-quarter) from 0.7%. It is one of the fastest growing economies in the EU. Separately, Germany, where deflationary pressures have eased, reported a sharp 2.3% drop in March retail sales. The market expected a small increase. It is the second decline in a row, and the largest decline since December 2013. German unemployment remained at record lows in April (6.4%). In contrast, Italy's unemployment rose to 13.0% from 12.7%. The market had looked for a little improvement. Inflation on a year-over-year basis in Italy was unchanged at zero. Unemployment in the euro area as a whole was unchanged at 11.3%--more than twice that of the US. The April inflation readings was confirmed at zero, having spent the previous four months in deflationary. The dollar-bloc is not participating in the move against the dollar today. Poor terms of trade figures from Australia keep the market on edge about a possible rate cut next week. The Reserve Bank of New Zealand as dovish, opening the door to a rate cut later this year, if demand weakens or if the currency remains "unjustifiably and unsustainably high". Canada reports Feb GDP and the second consecutive decline is likely. It would be the third monthly contraction. 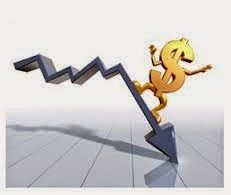 The US dollar fell to CAD1.1950 yesterday, but is trading around CAD1.2040 now. Resistance is now seen near CAD1.2070. The Bank of Japan left policy intact. It did push out when it would likely reach its 2% inflation target. Inflation this year is forecast to rise to 0.8% compared with 1% forecast in January. A year ago, its forecast was 1.9%. The BOJ shaved its growth forecasts for this year and next by 0.1% to 2.0% and 1.6% respectively. The US has a full slate of data. The Employment Cost Index is important as policy makers and investors are sensitive to labor cost pressures. The April Chicago PMI is also important as investors and policy makers look for some confirmation that Q1 weakness was transitory. The March personal income and consumption data was already embedded in Q1 GDP and therefore contain no new information.